– After a winter break of 3 months, I started to prepare for the Dordogne Integrale which is a 130km race held in May. A good opportunity to train in volume early in the season to catch up. – In June, I took advantage of a few races of the Euro Tour close to home, to change my training pace and allow me to intensify physical fitness. It was a rich period both physically and technically because I left the flatwater to go play at sea and get out with friends! Thanks to Total SUP and Air Tahiti Nui, I was able to win a ticket to participate in the “WATERMANA” at the end of November in Polynesia on the island of Huahine! An extraordinary experience and rich in sharing with others! 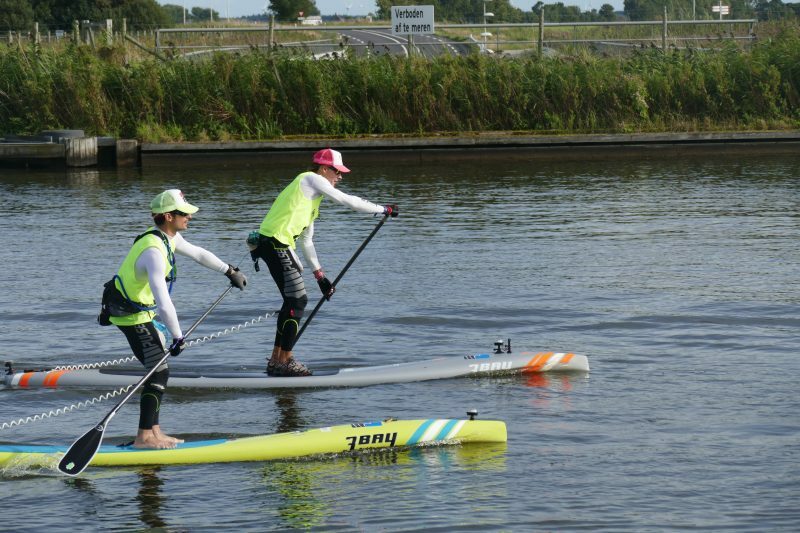 – End of July, was the deadline of my main objective: Attempt of world record of the longest distance in less than 24 hours on Flatwater by SUP. That was done with 202.8km in 23h15 and despite scorching conditions making the test more than difficult! A shared pleasure with the 3 Bay team, on Lake Aiguebelette in the Savoie region, because it was also set 4 New Records of the world (Solo SUP 14’ on Flatwater Woman and Man, Tandem SUP and Solo man in prone). – Fourth incredible highlight of my season and which was not planned in my program at the beginning of the year. Thanks to Total SUP and Air Tahiti Nui, I was able to win a ticket to participate in the “WATERMANA” at the end of November in Polynesia on the island of Huahine! An extraordinary experience! It is a competition in different sports: SUP, swimming, prone, running, canoe all around the same theme which is “water”. An exceptional event in a paradise setting that gave me the desire not to settle in Polynesia … whatever, but to have taken a liking to other forms of paddling including the PRONE PADDLE! WHAT WERE YOUR 2018 PALMARES? 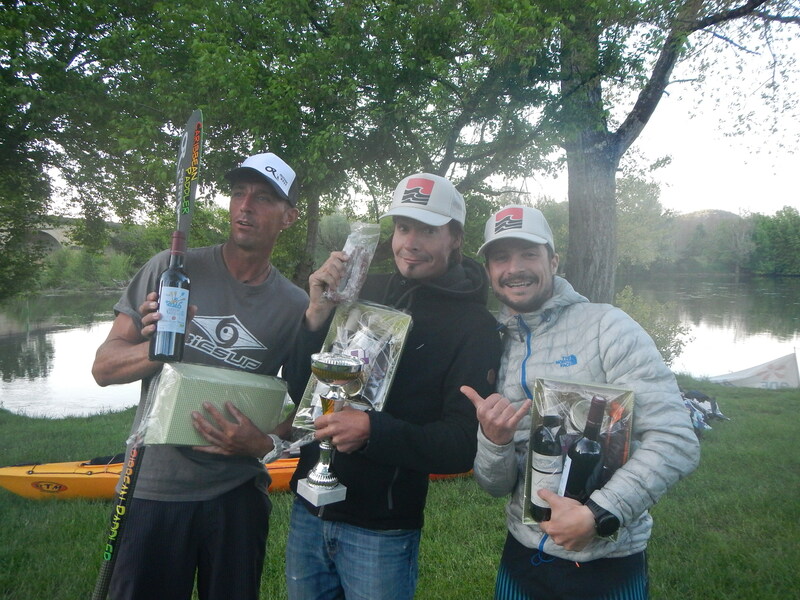 – Winner of the Dordogne Integrale 130km, for the fourth time. – World record of the longest distance in 24h. – First at the KOSTALDEA (San Sebastián – St Jean de Luz) 30 km. – Champion of France Master long distance in 12’6 in Bordeaux. WHICH BOARDS HAVE YOU USED FOR THIS SEASON? In 2018, I used the 3 Bay FLATWATER in 14 ‘ x 23 “with a much wider tail than the 2017 version, allowing more stability on rough water. And especially for the world record, Patrice made me a “crossbow” 18 ‘feet by 22 “just waiting to eat miles! HOW DO YOU ORGANIZE YOUR PREPARATION AND TRAINING? My preparation begins with rest during the winter period. This year, I practically did not paddle for 3 months and just did a little physical activity to keep me in shape (running, skiing, indoor sports). Then, as in any endurance sport, the fundamentals of the physical qualities necessary (strengths, power, speed, flexibility, endurance …) that one wishes to work on or develop in according to your objectives. My main goal was the world record! – The month before Dordogne Integral, 3 training sessions per week with 2 workouts of about 1h to 1h15 with increased intensity (either based on my speed or my heart rate) with a little technique to warm up and to recover. And a long excursion of more than 1h30 with a cruising speed. – After the test of the Dordogne Integral, still staying on a basis of 3 sessions per week, a more varied workout on different bodies of water, conditions and boards (surf, upwind downwind) but also on on the intensities of effort by the intervals to get out of my comfort zones The few events of the Euro Tour were an integral part of my training and were very rewarding to maintain motivation. – The last month before my world record attempt I increased the distances and lengths of time. I mainly did 4 sessions / week with inside outings of more than 2h30. The last sessions were always difficult but beneficial to feel confident 10 days ahead of the deadline! This is roughly what my preparation for the 2018 season looked like but far from perfect and is only an overall representation of my training. My season will be more varied, SUP RACE, PRONE and SUP SURF. I will compete more on the Coupe de France 14 ‘which we do not know the dates yet and on some stages of the EURO TOUR as last year, but I will add some races of Prone to my program (KELT OCEAN, DUNE PADDLE CROSSING and KOSTALDEA). For SURF, SURF longboard, it will be specially to find my first steps not on stand up! My name is Florent Dode, I am originally from Font-Romeu in the Pyrenees. I moved to Vieux Boucau, in Landes Region 6 years ago. I am a physiotherapist for most of the year but return to the mountains for winter where I am a ski instructor during the school holidays. WHEN DID YOU START SUP? It’s funny to think I first tried Stand up Paddling in Vieux Boucau in 2015. I did it using an 11 ” longboard with a canoe paddle that I adapted using an aluminium tube. Growing up in the mountains means I have been skiing since I was 4 for fun and at competition level where I excelled. Now I cross-country ski in winter and do biking and running the rest of the year. RACE SUP or SUP SURF? As for the Sup Race, I go between the lake and the ocean when conditions permit me. Having no SUP surfing board for a year, I get 12’6 fun when it’s not too big, otherwise I’m pretty longboard SUP surfing! – 2nd (2014) and 3 rd. (2015) Morbihan Paddle Trophy a 23 km race. – 2014 Champion of Aquitaine in 2015. WHY JOIN TEAM 3 BAY? For me, joining 3 BAY is to support “Roro” (Patrice REMOIVILLE) a good friend who shares my passion for Stand up Paddling, good food and . It is thanks to him that I could participate in my first SUP race on one of his AVP Board. Then he helped me to join BIC Sport as a team rider. A new adventure begins for Roro with BAY 3 and I’m excited to be a part of it!